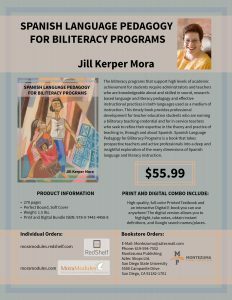 This notice is to announce the publication of Dr. Mora’s book Spanish Language Pedagogy for Biliteracy Programs on August 30, 2016 from Montezuma Publishing. The book is available in a print-on-demand and eTextbook “bundle” from Montezuma Publishing. 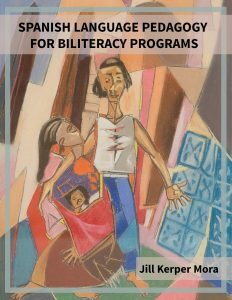 Click here for direct purchase of Spanish Language Pedagogy for Biliteracy Programs. Dr. Mora’s book is also available through Amazon and other online book sellers. If you purchase from Amazon or another online book merchant, the print book has a QR bar code that gives you access to the eTextbook. Please click here for an overview of options for Professional Learning Community opportunities and self-paced dual language teacher professional development through MoraModules. Please consider purchase of the Spanish Language Pedagogy Book Companion Website on MoraModules. Go to the MoraModules Home Page for package options. The Book Companion Website offers the following features. Please click here for a Video Tour to the many features and resources available to dual language educators on Dr. Mora’s Book Companion Website.